Sky Q is the new smart home entertainment ecosystem from Sky, offering multi-device viewing, simultaneous recording, a bluetooth remote control and a lot more! Some of the bonkers.ie crew went along to a demonstration of the product. Here's what we learned. When Henry Ford founded the Ford Motor Company, he said “if I had asked people what they wanted, they would have said faster horses”. If I asked you how your TV viewing experience could be improved, what would you ask for? It’s a tough question, right? The rate of innovative improvement in how we watch the box over the last few years has been quite remarkable. Pause and rewind, on-demand and multi-device viewing are all still relatively new breakthroughs. It’s hard to know how to make things much better than they already are. Thankfully, we have product whiz Andrew Olson and his team at Sky to take care of this! And they claim to have “completely re-imagined TV” for consumers with the launch of the highly-anticipated Sky Q. A few of the bonkers.ie crew were lucky enough to attend a demo of the new system with the inventor himself just last week. Here’s what we learned. To summarise, Sky Q is an extremely slick new home entertainment ecosystem, which wirelessly connects multiple devices across multiple rooms and smartly incorporates online viewing into a centralised system. Sky reckons its the first 'Fluid Viewing' experience available to customers. Users can pause TV in one room and take up where they left off in another, stream TV programmes to multiple devices and save recordings for offline viewing while they’re on the move. There’s also a touch-sensitive Bluetooth remote, an app and over 300 box sets ready to watch. Oh, and it’s 4K-ready (that’s ultra HD, folks!). Let’s look at how these features are bundled together and, importantly, how much it’s going to cost customers. ‘Silver’ is the name given to the premium Sky Q product, which comes with over 300 channels (60 of which are HD) and hundreds of box sets, ready to watch. Customers can also record four different TV programmes simultaneously while watching a fifth live, so no more battles for control of the remote and no more agonising time clashes between your favourite programmes. And you won’t have to worry too much about filling your Sky Q box with all of those recordings…it has a 2 terabytes of storage, which is 350 hours or about 200 HD movies. Sky Q also lets you pause a programme on a TV in one room and take up where you left off on another TV in another room. Sky Q’s Mini boxes make this possible. And the great thing about them is that they are wirelessly connected. The Sky Q app allows you to stream your TV on up to two tablets around your home and to save recordings to watch offline while on the go. This is the closest things we’ve seen to ubiquitous on-demand viewing, tailored to every person’s unique viewing habits. Sky’s name for this is Fluid Viewing, and for a system so adaptable, it’s certainly an appropriate title. Highly-popular internet stations such as YouTube and Vevo are also available from the Sky Q Silver Box, allowing you to browse the millions of clips on offer there without having to change device or settle for an smaller screen size. You can also sync music from Spotify and photos from Facebook to your TV. 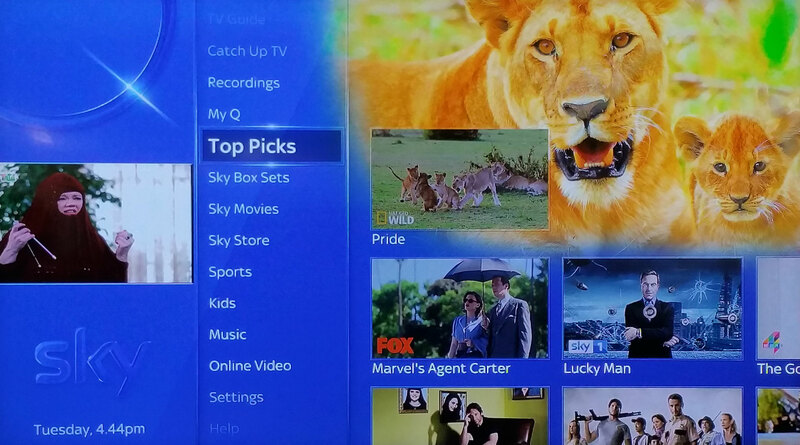 The TV guide and screen browsing experience with Sky Q is as slick as you might expect from a system this dedicated to giving customers what they want. While watching a TV programme, you can browse other channels and see a live stream of what’s happening in the form of a small second screen. This may be particularly handy for users watching a movie but also wishing to keep an eye on the latest score in a football match, for example. Yet another appealing aspect of the system is the Sky Q Hub, which allows Sky broadband customers to turn their Sky Q boxes into WiFi hotspots, which greatly helps with broadband connectivity and power throughout the home. Sky Q Silver costs €67 a month and comes with one Sky Q Mini box, which allows viewing on a second TV. This package comes with a one-off ‘smart features charge’ of €299, which is a bit like an installation charge. However, if you sign up for Sky broadband or Sky Sports or Sky Movies, this cost will drop to €99. If you’d like to add a third screen, you can get an an additional Sky Q Mini box for €99. Existing customers will have to pay a €50 installation fee on top of this. It’s important to note that the Sky Q equipment is actually loaned to customers and must be returned at the end of the contract, which is a minimum of 18-months. But the good news is that repairs are free over the course of the subscription. The main difference between Sky Q Silver and Sky Q is that the latter does not come with a Sky Q Mini box. Also, Sky Q “only” has storage of 1 terabyte and has the capacity to record “just” three programmes at once, while watching a fourth live. At €55 a month, it is a little cheaper too. The ‘smart features’ cost comes in at €249, but is reduced to €99 if a customer also signs up for Sky Sports, Sky Movies or Sky broadband. Sky Q is a hugely impressive, slick system which has done a phenomenal job at finding a new way of improving the viewing experience for the modern TV fan. Namely, by seamlessly centralising online and offline content in one place by giving customers more control than ever over how, where and when they watch their favourite programmes. If you love TV and tech, this will be a very appealing set up. Also, if you’re living in a busy household, the ability to watch in different rooms, on different devices and at different times thanks to massive recording abilities, you’re likely to be very tempted too. Sky Q’s fluid viewing system will be available on bonkers.ie from Friday!